All of Volumetric Technologies filling machines are designed to fill products at the fastest speed with the highest accuracy rate with the lowest level of product degradation. Just like all of our other products, our Piston Bakery Fillers are made with the highest grade of FDA/USDA approved materials and stainless steel. For your bakery kitchen needs, Volumetric Technologies line of Bakery Depositors and Filler Machines are the perfect solution for all your filling needs, whether manual or electric. All machines are customizable and built to be tailored to your individual businesses needs. All of our filler and depositor machines start with the horizontal and incline series machines. Read about all of our offerings for depositor and filling lines below. For tray machines, pie lines, and dough sheeters with the ability to handle large particulates, piston filler/depositors are typically used in conjunction with multiple automated lines for efficiency and product preservation. Available in single or multiple head, with numerous options and add-ons such as choice in nozzles, carriages, choice of hopper and much more. A lightweight, versatile, no electricity required table top filler, bench top piston fillers are perfect for liquid or gel products such as fruit fillings, sauces, shampoos, soaps, essential oils and so much more. Customizable to fit your exact needs, with different nozzle options for multiple bakery needs for filling anything from doughnuts to pies to cupcakes. 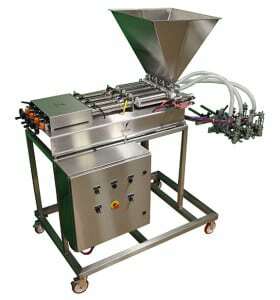 A sturdy, user-friendly, dependable Servo filling machine, that can handle up to 18 fills at a time. Control this machine via the touch screen menu to custom configure the machine for your filling purposes. Select this machine for tray filling, cup filling, and pie and doughs. Perfect for depositing soups, stews, cheese sauces, refried beans and ready to eat products into bags or pouches. This robust machine can handle hot or cold materials, is completely portable, and operated with hand and foot. Make the process one step easier with the available vacuum heat sealer. Our Bakery Pump Fill Stations are easy to break down, easy to clean, since no tools are required for disassembly. For liquid and semi-liquid products with particulates, the Horizontal Piston Filler is the most innovative machine available. Use this machine either on the floor or on the table for bottom-up filling. Like many of our machines, this comes with your choice of single or multiple head design. Tool-free for easy break-down and in-sink cleaning and height adjustable with manual or electric screw actuators. If you want a machine faster than the Piston Filler, with recharge time, then the Servo Pump Filler is right for you. 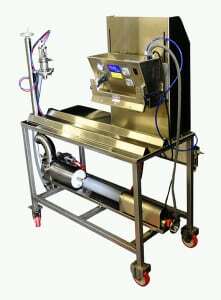 Use this machine for liquids and liquid type slurries with small particulates. This machine comes in a variety of styles for a variety of uses, most commonly for dough sheet lines, ribbon stripper for fruit slurry stripes on dough sheets. Most of our customers use this machine along with a conveyor line to further ease the bottle filling process. Read more about this incredibly accurate Pump Filler.